Darkwing Duck is St. Canard's vigilante crimefighter, a father and office worker in his off-hours. He has a short temper, is reserved, and is extremely protective of his adopted daughter Gosalyn. In his superhero mode, is very determined and hates to be overshadowed by others (i.e. Gizmoduck, Quiverwing Quack). He falls for and begins dating the witch Morgana, much to Launchpad's abhor. 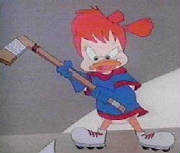 Gosalyn is Darkwing/Drake Mallard's adopted daughter, a tomboy who was formerly raised by the inventor Professor Waddlemeyer. She now lives with Launchpad and Drake, her best friend being the neighbor boy Honker. She is independant and bold, loves sports and her father's crimefighting (much to his chagrin), eventually making her own persona called Quiverwing Quack. The youngest son of the Muddlefoot family, whom live next to Drake Mallard. Honker is a smart, shy young kid, close friends with Gosalyn and tormented by his older brother Tank. He is well aware of the fact that Drake and Darkwing are the same person, and later joins Gosalyn's crimefighting stunt as The Arrow Kid. Megavolt, formerly known as Elmo, was one of Drake Mallard's classmates in the mid-1970's. He acquired the ability to manipulate electricity through a science project accident, causing him to lose most of his memory. He lives alone in a lighthouse, obsessive and maniacal, his only friends being "rescued" lightbulbs and Quackerjack. Coming from an alternate dimension, Negaduck is the sadistic polar opposite of Darkwing, and the leader of the Fearsome Five. He hates anything cutesy, and carries around a variety of weapons, bombs and chainsaws being his favorites. He is extremely volatile, and keeps the rest of his team in line fairly easily. On occasion, Negaduck has been attracted to Morgana. Launchpad is DW's sidekick, and made the Thunderquack as a fan project shortly before he met Darkwing. He is clumsy and airheaded, but upbeat and devoted, also acting as an older brother to Gosalyn. He originally appeared in Ducktales as Scrooge McDuck's personal pilot, and later in the short-lived Raw Toonage. Morgana is Darkwing's girlfriend and a sorceress, who was formerly involved in magic-aided thefts of money, with the intent to pay off her student loans. Charming and seductive, she is unafraid to say what she wants, and sometimes has fallouts with Darkwing over misunderstandings. Her father Morculo hates the fact that she's dating a mortal, but her family likes Gosalyn. Morgana teaches at a magic academy in her free time. Formerly a genetic engineet, Bushroot accidentally modified himself to be partly plant-based and able to communicate with plants. He is very sensitive, cowardly, and was motivated to crime by loneliness. 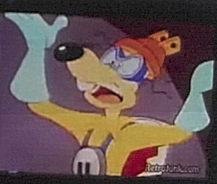 He later joins the Fearsome Five, The Liquidator being his best friend in the group, but teams with Darkwing a few times in the series. Quackerjack was an independant toymaker in the late 1980's, creating bizarre and usually threatening toy items, and went out of business when the video game Whiffle Boy debuted. Demented and sometimes even sadistic, he modifies toys into bizarre weapons for fun. He carries around a toy doll called Mr. Banana Brain, speaking for it in a different voice. Formerly the owner and advertiser of a bottled water company whom was pushed into a vat of chemicals, the Liquidator is entirely made of water, and has the power to control other water sources. He is arrogant and confident in himself and the Fearsome Five, speaks in advertising jargon almost constantly, and at one point was accompianied by three female accomplices who wore giant costumes.